I'm home! Didn't post much the past couple of days because Max and I came back from LA and went straight to unpacking all our moving boxes that finally had arrived from Amsterdam. So as we are wading through trash (did I really need to bring those ugly folding chairs?) and treasures (I love this old picture frame!) 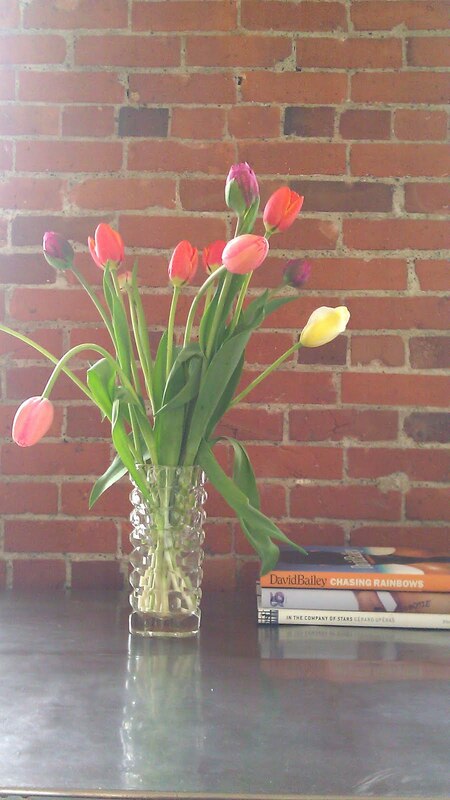 our apartment is starting to look like a home. We also finally found a dining table. And with found I literally mean found. It was hidden in a nook of the garden of my dear in-laws, behind the chicken coop. For a table that has been outside in the Seattle rain for about 8 years it is in surprisingly good condition, and it cracks us up to have found a great table behind the chicken coop! After seeing dining room sets at places like Restoration Hardware, Design Within Reach, and other ridiculously expensive places we feel like we got away with the best deal ever: a free table with a cool story to tell about it. 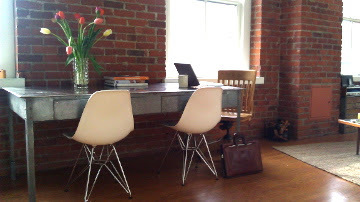 Of course we couldn't wait to pair it with some white Eames DSR side chairs, so now we can finally eat at the table instead of on the couch. We will have to get more of them later for dinner parties! 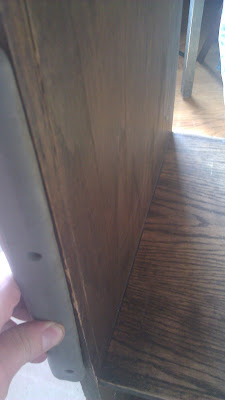 Restoration Hardware or Behind the Chicken Coop? You tell me! 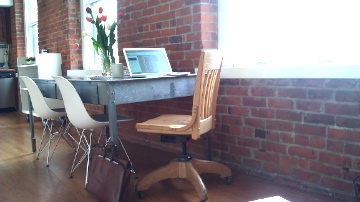 The wooden chair is from the City of Seattle Surplus and cost a whopping $5. We are still deciding on wether we want to paint it or not. 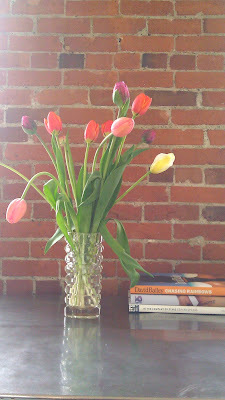 A few Dutch tulips make everything look better! Another great apartment find came from the City of Seattle Surplus Warehouse, a place Max's dad likes to purchase bicycles that will never ride again, vintage computers without power cords, slate rock (you never know when you might need some) and other useful and 'unique' items. The first time he took me there I managed to get away without having to buy anything. But the second time, he made me an offer I couldn't refuse as he mentioned there were now library carts available at his beloved surplus. For those of you that wonder how come he thought I could possibly want a library cart I'll make a long story short: I'd shown interest in one during my first visit, firstly to be polite and show interest in something, and secondly because I knew it wasn't for sale. So here I was, eye to eye with an old, wobbly, dark oak and filthy as hell library cart. 'It's perfect! ', I squealed to do my father-in-law a favor. As I saw how amused the good man was that he had managed to sell me on something at least 20 years past its prime, I realized I had reached the point of no return. This library cart and I were going home together. The moment Max first laid eyes on said cart, he was about ready to push it down the hallway, into the elevator, and out into the street. 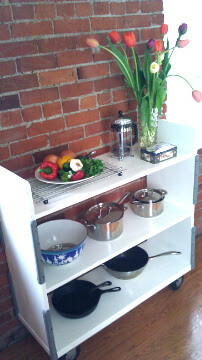 But a simple dose of DIY magic made even this old cart into the star of our kitchen, now proudly holding pots and pans. Pretty awesome if you ask me... we sacrificed part of our 'dance floor' but I love how our apartment feels so much cosier now!